TheTownCrier: Posts of the day - Best of the web! 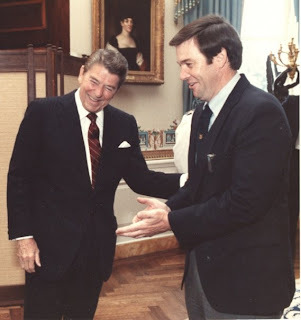 Photo: Duncan Hunter meeting Pres. Ronald Reagan. Conservatives criticize blacks for staying on the democratic reservation but conservatives are much more stupid. They stay even though the republicans are actively fighting conservatism. At least blacks get some nice benefits for being voter slaves. What you want us to do is surrender to the liberals by compromising our ideals. I won't do it, and I won't surrender our nation to mexico, or to a north american union." I want that feeling again. I want to vote FOR someone, not against someone or in spite of someone. That is a loser's mentality. It just plain feels good to vote for what you believe in. I'll never fall for the Boogieman Card again. Robert Rector, Heritage foundation study: "Each household headed by a high school dropout costs the U.S. taxpayers about $22,000 a year. That`s benefits in excess of taxes paid. Each immigrant that you bring in that doesn`t have a high school degree, whether it`s legal or illegal, is during the course of his lifetime going to cost the taxpayers about $1 million, that`s benefits in excess of taxes. They are fantastically expensive and no one is really paying attention to this. Just more benefits of 'Conscience free trade' with China!!! And Duncan Hunter is the ONLY one addressing the problem!